Pupils of the class 4.2 of the school Dell’Heicht had made a school newspaper and have sold copies to collect 217€. Instead of going to eat a pizza, the pupils decided to make a donation to the less fortunate people and chose the Stëmm vun der Strooss. Tuesday October 2nd the pupils visited with their teacher Laurence Clement the facilities of the Stëmm vun der Strooss in Esch sur Alzette. 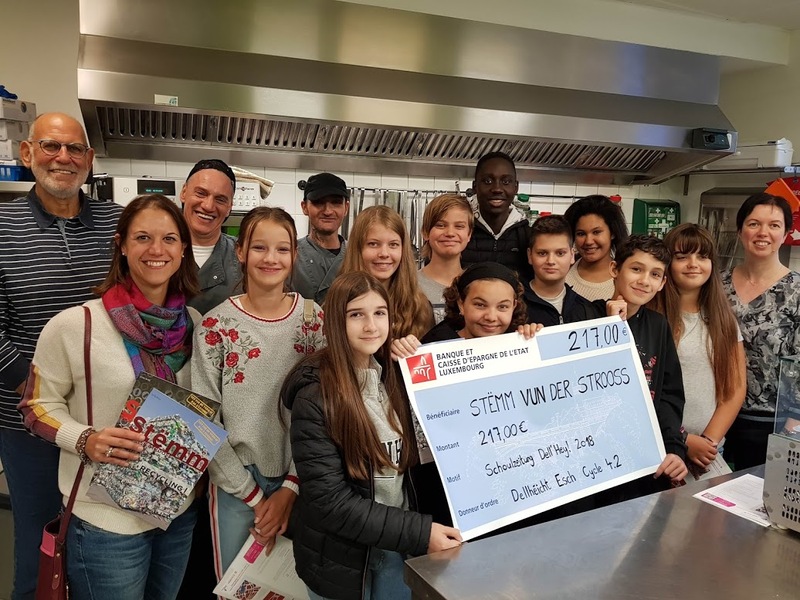 The visit ended with the handing over of the cheque to the President of the Stëmm Marcel Detaille and to the person in charge of the site of Esch, Claude Cosndorf. An evening of solidarity and mutual aid.